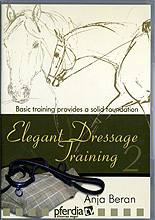 DVD Elegant Dressage Training, Volume 2 shows that sound and careful basic training is the most important basis for any horse's successful development. In the this DVD, Anja Beran and her team show how they work with young horses. Following proper work at the lunge and a careful start under the saddle, the spectator can witness how first steps of lateral movements lead quite naturally to first steps of collection. Anja guides you through the classic Iberian principles beginning with basics such as how to longe correctly and with selective equipment and without auxiliary (side) reins. Following this you'll see how the horse accepts his first ride and how the work with the flexion of the horse to the inside and outside govern the progress and acceptance of the leg toward leg yield and shoulder fore. The video production is very good and well sectioned for easy review. The indoor arena is beautiful as are the horses so you find yourself easily carried away into the quiet harmony and practice of Anja and her team. Informative and with good guiding principles for the rider or trainer. Anja has provided good groundwork and procedures to take you past the basics. The well respected Manuel Jorge de Oliveira covers some of the riding basics and puts two riders through their paces including Anja. Some keen advice on not overtaxing your young horse is backed up by the doctorate studies of Dr. Matilda Holmer-Rattenhuber. At the end you will see the expertise of using the correct seat through a demonstration with a skeleton - who the doctor places upon the back of the horse sans legs to showcase how our pelvis and hips work on the horse's back. A bonus at the end as baroque horses are replaced by a warmblood/thoroughbred type though not sure why he's in a double bridle. The goal is to have the horse showcase his improvement from this workout to the one on the end of the next video in this series apparently. Recommended DVD for those that wish to learn the Iberian principles and the in hand work being up front with baby piaffer steps before riding too much, is clearly a useful exercise that benefits work later on in the saddle. The Spanish Walk and its training though controversial in some classicist circles, is demonstrated here too.